Fresh-baked bread is not difficult to make. 3 What Happens if You Leave Bread Dough to Rise Too Long? 4 What Is Artisan Bread? The smell and taste of a baked bread straight from the oven is one of life’s finer pleasures. Bread dough can be made from scratch or purchased from bakeries and grocery stores, allowing you to bake the loaf fresh. With a few common household items and a little time, fresh-baked bread is yours to serve or consume. Preheat the oven. Set the oven to the temperature recommended by the bread recipe. 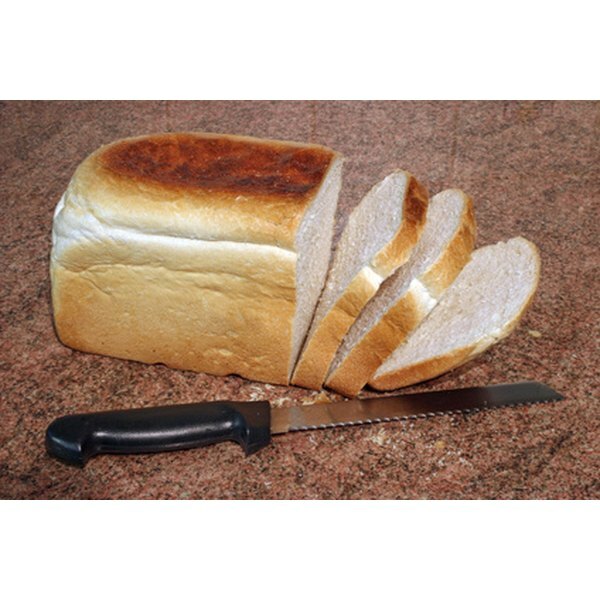 A specific and constant temperature is often required for the bread to properly bake. Most basic breads that only contain yeast, flour and water are baked at high temperatures of 400 or greater. Breads that contain milk, eggs or butter are often baked at lower temperatures. Once the oven has been preheated to the proper temperature, place your bread dough on a baking sheet or in a loaf pan. Put it into the oven. The heat transforms the moisture in the dough to steam, causing the bread to rise. After the dough has risen, the final shape and size sets and the crust forms. The oven door should not be opened until the bread has completely formed, including the crust. Apply a mist of water to the oven, using a spray bottle. Spray the sides of the oven. The water transforms into steam, which then raises the temperature of the oven. Make sure water does not come in contact with electrical components of the oven, including the fans and heating coils. Close the door immediately after misting the oven. Leaving the door open too long will cause heat to escape, resulting in bread that won’t properly form. Check the progress of the baked bread. Use the baking time in the recipe as a general guide for when it's done. The bread should feel firm and appear golden brown. A loaf of bread that appears too hard may have been cooked too long. If the bread feels spongy or doughy, it is undercooked. Remove the bread and tap on the underside of the loaf. If you hear a hollow sound, the bread is probably done. If the sound is dull, the bread may need to be cooked a little longer. Does Heat Kill Lactobacillus Bacteria in Sourdough?